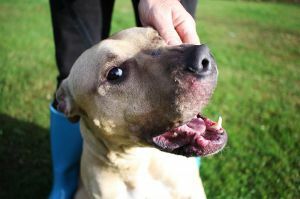 Hi My name is DEMITRI and I am a very friendly THREE YEAR old male Staffordshire terrier mix weighing 50 pounds. I have a beautiful fawn colored coat. I am as sweet as they come and love everyone including other DOGS, CATS and CHILDREN. My favorite past time is being hugged! Hey! who doesn't like that ?? I am very well behaved and my foster mom says I am just the perfect dog and any family will be lucky to have me in their home. I am neutered and have all my shots and I am house trained.